An hour’s drive south of Denver, Colorado Springs boasts a dramatic backdrop of rolling hills and, towering above, Pike’s Peak. 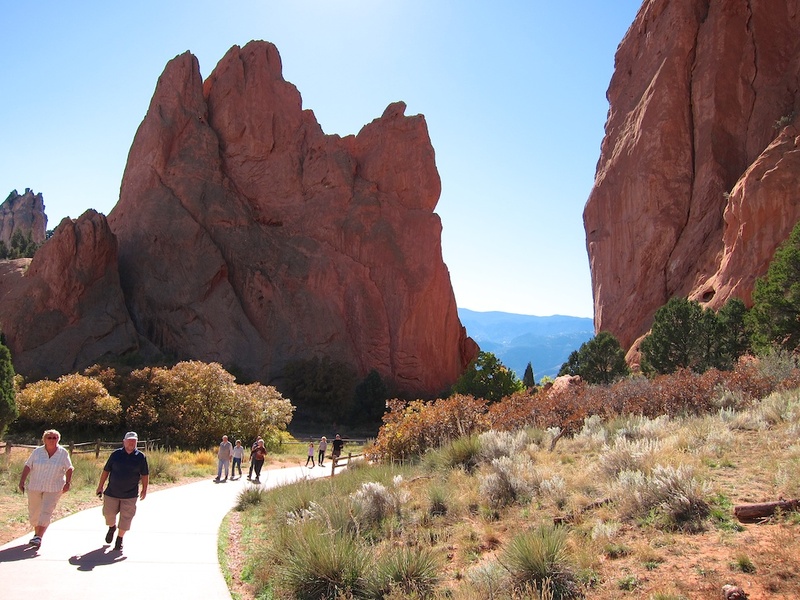 It’s arguably the nicest setting of any city along the I-25, enhanced by the dramatic collection of red sandstone blocks in the Garden of the Gods. With a population of more than 400,000, it’s Colorado’s second-largest city and biggest in area, which you’ll soon realize if you drive around during rush hour. A rare American town developed originally as a resort, Colorado Springs today has a strong air force and army presence and has become somewhat of a magnet for evangelical Christian organizations. It has a decent culinary scene but doesn’t match Fort Collins or Boulder in quality. The majority of good places are in or around downtown. What, we haven’t had Ethiopian yet on this road trip? Truth be told, I’ve never had it in my life, and I have to be instructed how to eat the fragrant, stew-like dishes sans cutlery when I show up at Uchenna Ethiopian Restaurant. 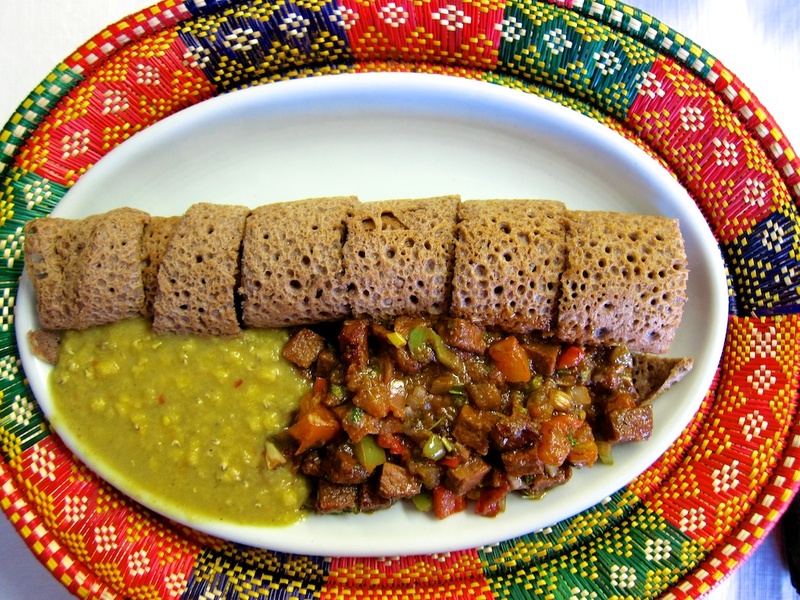 First, you tear off a rolled-up piece of spongy injera, the slightly sour staple of Ethiopian cuisine. Then you use this bread to pinch a mouthful of food, licking whatever morsels stray onto your fingers. The eating style is as distinctive as the dishes, which lean heavily on house-prepared 12-spice mixes for the unique flavours. My choice of Yebere Wat features chunks of beef tenderloin in a tomato and awaze sauce, with a side of micher allesa (split green lentils with ginger, garlic and onion). It’s a unique, wonderful eating experience. This is very much a one-woman operation, with glowing owner Maya Hetman greeting me and then heading to the kitchen to help with the cooking. The only thing that prevents me awarding a * is the somewhat slow service during my visit. But then, maybe it’s just me who hasn’t slowed to Maya’s beatific pace. If it’s not quite fast food, La Casita Mexican Grill is certainly quick food. 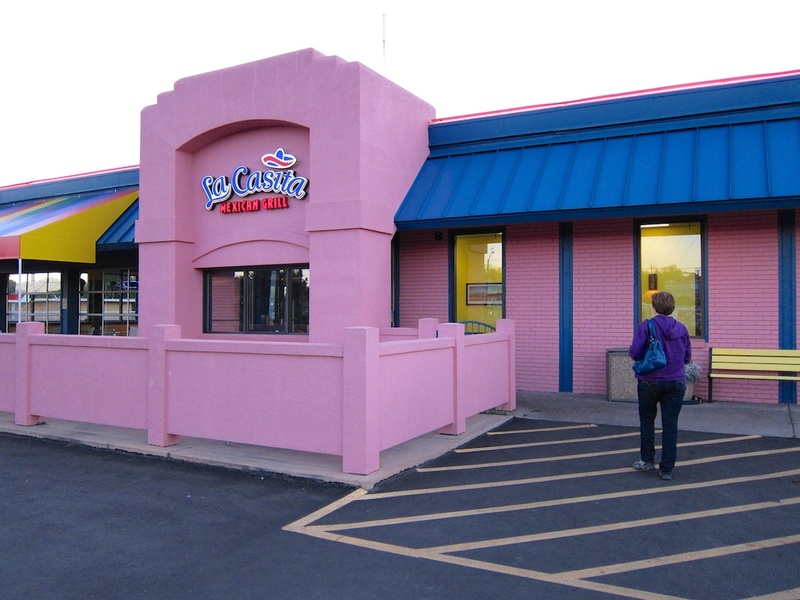 This three-outlet “chain”, in vibrant pink buildings, is a longtime Colorado Springs staple, churning out authentic Mexican meals mere minutes after they’re ordered. The challenge is making choices from an extensive menu—should I have the chicken fajita plate or the green-chili enchiladas? Maybe some bean-and-cheese tacos?—before reaching the front of the fast-moving line. I’ll make things simple for you. Hit La Casita’s strengths and concoct your own delicious meal. Start by ordering at least a couple of their excellent, thick tortillas, hot off the grill; indeed, these things are good enough to eat on their own. Then, get a side of borracho pinto beans, cooked in beer, which are far superior to the bland, tasteless paste known as refried beans in most Tex-Mex joints. Add a little basket of fresh tortilla chips and maybe some green chili sauce and then head to the condiment station to fill little cups of salsa and pico de gallo. There, you’ve got a fine Mexican meal for only a few bucks. In business since 1956, King’s Chef Diner wears its vibrant yellow and purple colours proudly. This is a straight-up downtown breakfast joint, where the waitress tells you it’s cash only before the coffee’s poured. They serve big, egg-based breakfasts, including a tasty burrito. 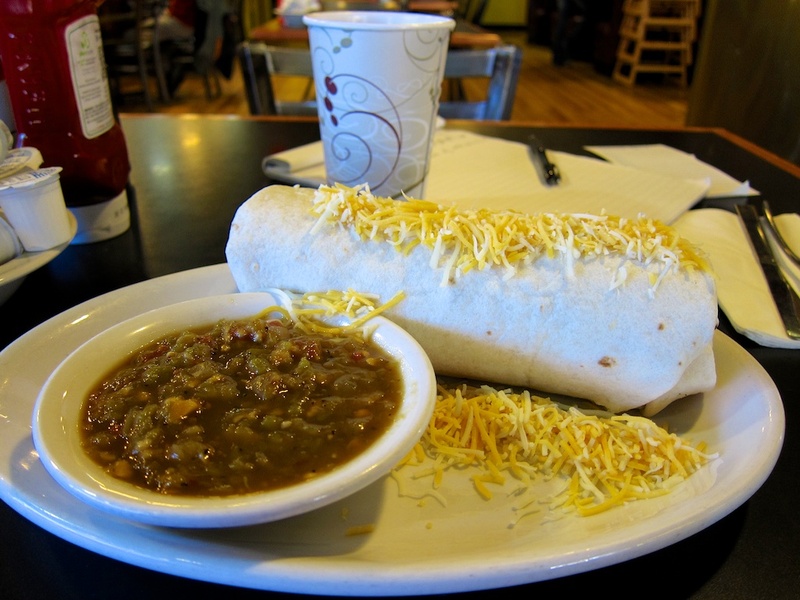 The highlight is the smothering of locally roasted Colorado green chili, which imparts a nice, slow burn to the meal. I can’t recall a java joint where they let me pour my own drip coffee. But Café Corto is an unpretentious place, where friendly co-owner Ben Gallejos-Pardo is happy to let me finish the pour-over at my table. And I must say, the resulting cup is better than many places where the barista retains exacting control. The showstopper, though, is the accompanying arepa, a hot, grilled Colombian corn cake with mozzarella and melted butter. Forget biscotti; this is the bomb. (Apparently in Colombia, they dump mozza straight into the cup and eat it once the coffee is finished.) 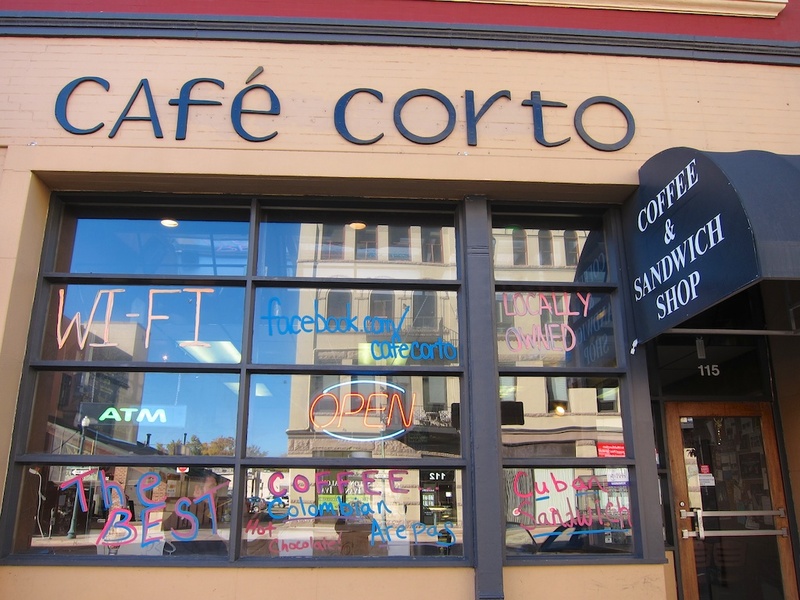 If you don’t mind the grungy furnishings, the family-owned Corto is also a good place to hang out for a Cuban pork sandwich or other arepa-based meals. A few blocks removed, Rico’s Cafe & Wine Bar is a decidedly tonier destination for a mid-morning meeting of girlfriends or for checking email along with a coffee and good fruit muffin. While you’re waiting for the big pots of Chemex coffee to finish dripping, check out the first-class greeting cards, peruse the used paperbacks next door in Poor Richard’s Bookstore or walk through the toy store to order a slice of pizza. It’s all part of the Poor Richard’s complex, a gathering of six businesses under one roof. I have to hustle out the door to catch Colorado Springs Omelette Parlor’s half-price omelette special, available only from 6 am to 7 am. So by 6:30, I’m shoveling down forkfuls of the skillet-prepared W.J. Palmer, a bacon-and-cheddar three egger, accompanied by slices of pan-fried potatoes and a buttered English muffin. A little greasy but perfect for the morning after a hike up Pike’s Peak. 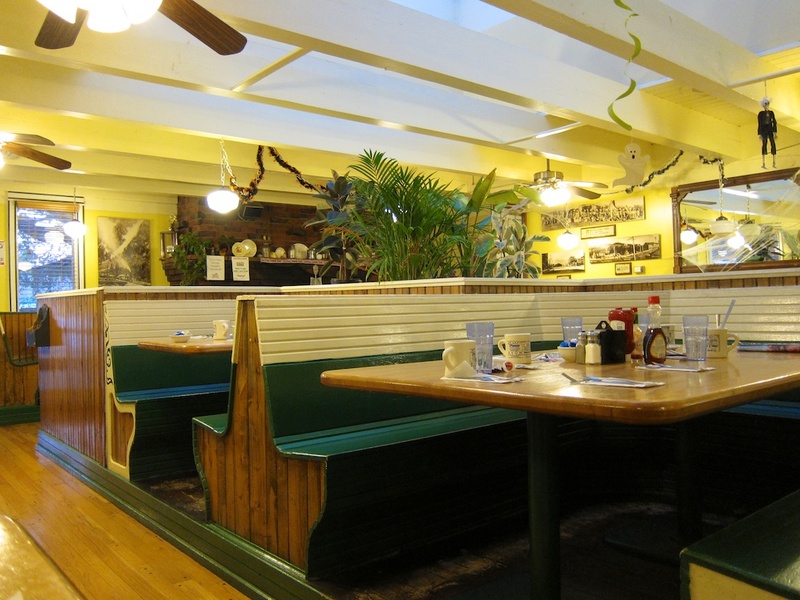 This is a character place, with lemon walls and wooden, park-style benches in the booths, lending an early 19th-century lodge feel to the place. While you’re in the neighbourhood of this retail thoroughfare in north Colorado Springs, drop by Colorado Coffee Merchants, a small roaster with a handful of cafe tables. Sit down with an Americano and watch the steady stream of regulars (including a cop who jokes, I think, that he’s getting ready for a gun fight) filling their to-go cups with Mexican or Cabin blends. It’s time once again for a more upscale dining experience. 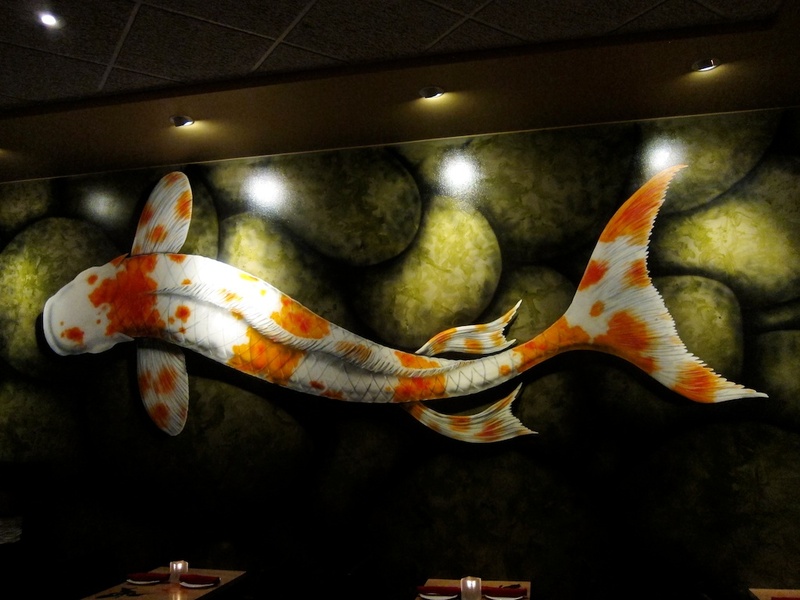 Nosh certainly delivers that, starting with perhaps the most artistic treatment I’ve seen in a restaurant—paintings of large, sinuous carp that literally glow against the dark walls. The food follows suit, mostly small plates that emphasize beautifully prepared and presented sauces. It’s all about slowly savouring the creative, complex flavours here, not the portion size. The highlight is a small, oven-roasted chicken breast with charred onions and two sauces: brown butter apple and burnt scallion. This is accompanied by a nice roasted cauliflower dish with cashews and a beet caprese, washed down by a great pint of nitrogen-infused Left Hand stout. Not a cheap, substantial meal but by no means a bank breaker for a chef-prepared dining experience. 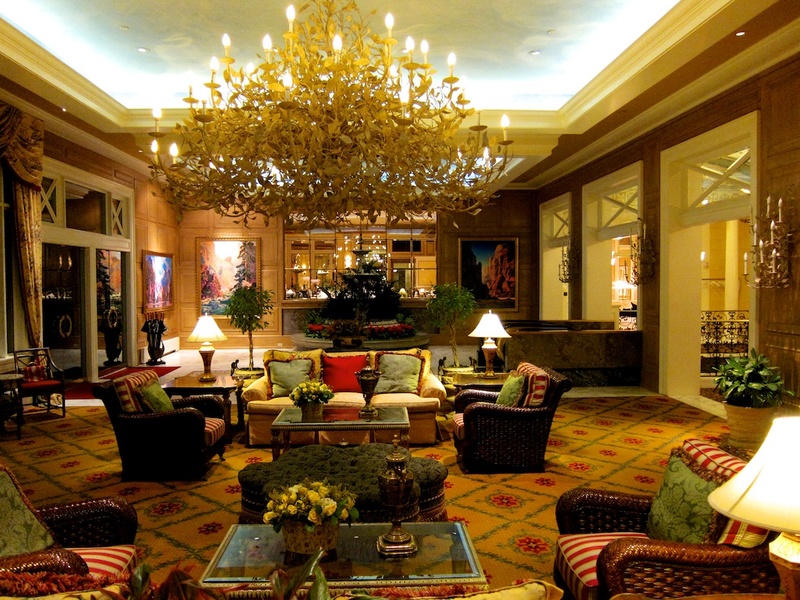 The perfect way to finish this indulgent evening is a quick tour of the Broadmoor Hotel, one of America’s finest hotels, with its lake and surrounding posh buildings. If you have to ask what it costs to stay here, you probably can’t afford it. But just tell the front gateman you’re going in for a drink or a burger, tip the valet parker and for a few minutes you can fantasize about belonging in this cosseted world. With its sandstone canyon walls, twisting streets and historic houses built up steep hillsides, Manitou Springs is certainly a charming place on the western outskirts of Colorado Springs. Well, maybe if there weren’t so many tourists. Even out of peak season, parking spots are at a premium and the sidewalks covered with visitors wandering in and out of gift shops and galleries. 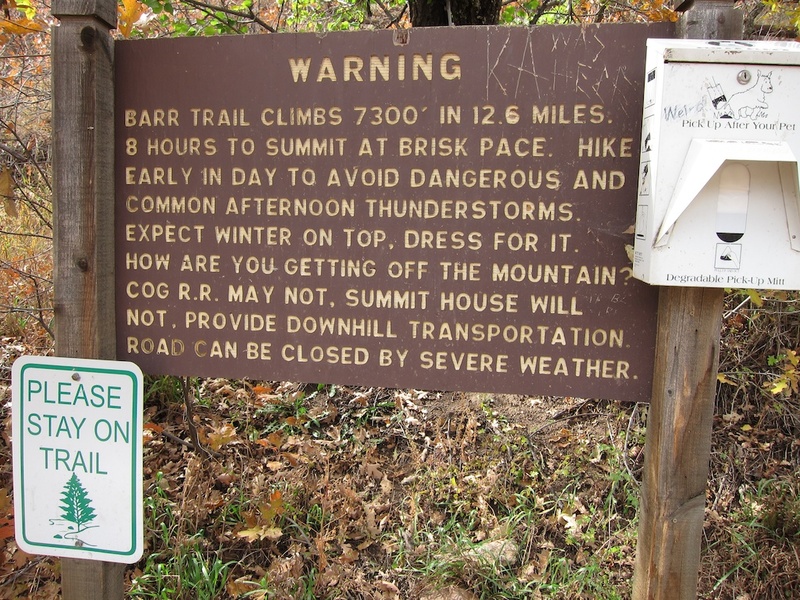 Looming over it all is 14,000-foot Pike’s Peak, but you’ll have to pay to reach the top: $35 to ride the Cog Railway, $12 a head to drive up yourself and even $5 to park for the Barr Trail and its 7,300-foot climb on foot. After a vigorous hike up the dusty lower Barr Trail, I’m hungry for something healthy. 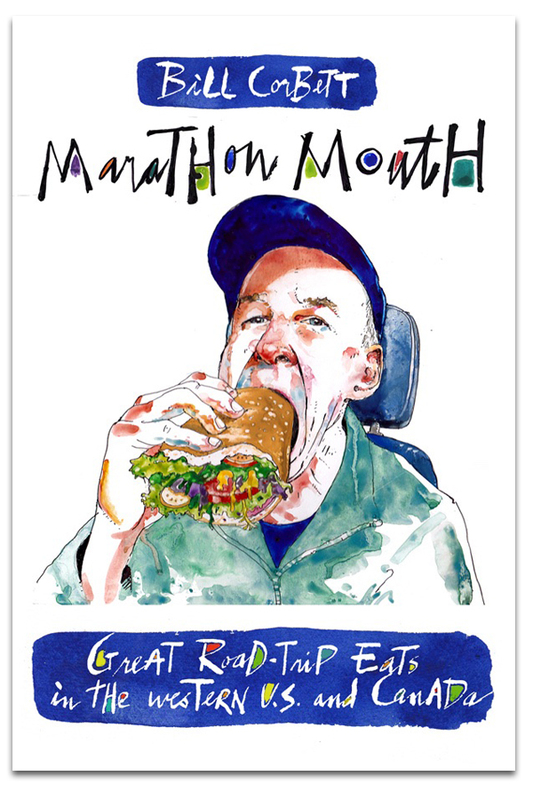 But my first choice, the lovely streamside Adams Mountain Cafe—with its devotion to slow, vegetarian-focused cuisine—has a lunchtime lineup. So I ask an exceedingly friendly gallery owner for suggestions and she recommends a berry salad… in a bar? I’m dubious as I enter Keg Lounge, with its dim lighting, long row of Bud-sipping patrons on bar stools, central pool table and classic rock soundtrack. But I do order the berry salad and am stunned when it arrives. 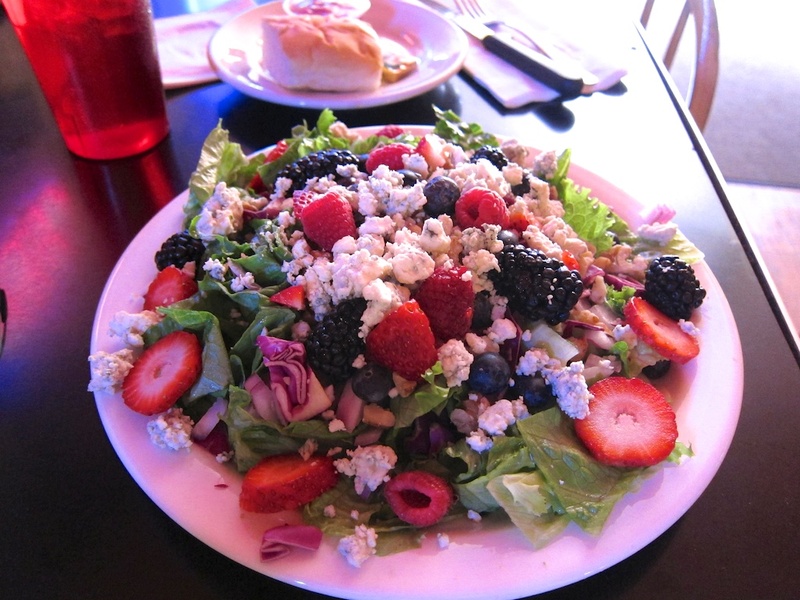 It’s a mountain of fresh raspberries, blackberries, blueberries and sliced strawberries over a bed of greens, blue cheese and walnuts. It’s the most fruit I’ve eaten in weeks. The Keg also does a nice half-pound burger, served on a long bun. It also goes against the bar grain by having no deep fryers in the open kitchen. This entry was posted in Manitou Springs, Restaurants and tagged colorado springs on March 13, 2013 by bcorbett907.